Universidad Laica VR de Guayaquil, Arquitecta. State University of New York, Doctor of Philosophy. State University of New York, Master of Environmental Science. 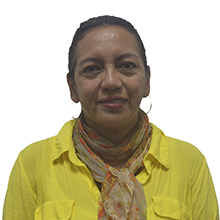 ESPOL- PROFESOR TITULAR AGREGADO 1 (TC), 2016-Actualidad. DIPLOMA DE HONOR, ESCUELA SUPERIOR POLITÉCNICA DEL LITORAL, 1996. UNIVERSIDAD ESTATAL DE NUEVA YORK COLEGIO DE CIENCAS AMBIENTALES, AYUDANTE DE INVESTIGACION Y ACADEMICO EN FACULTAD CIENCIAS AMBIENTALES, 2000-2004. MUNICIPIO DE GUAYAQUIL, JEFE DE CONTROL AMBIENTAL, 2004-2006. SECRETARIA DE GESTION DE RIESGOS, DIRECTORA PROVINCIAL, 2009-2010. UPSTATE MEDICAL UNIVERSITY - STATE UNIVERSITY OF NEW YORK, RESEARCH COORIDNATOR - ECUADOR, 2013-2014.